Against a backdrop of $100 per barrel oil prices (hey, it sounded astronomical at the time!) NCGS members car-pooled their way to east central California to visit the Coso Geothermal Field, situated within the China Lake Naval Air Weapons Station (NAWS). Andrew Sabin, Ph.D. (Andy), who worked in this area for many years and is currently on tap to become the director of the geothermal program, led us on a tour through young rhyolite domes, hissing fumaroles and boiling mud to view several operating geothermal plants and a new geothermal drill site. While the Navy is interested in testing weapons in the air at this location, geologists are interested in features on the ground and more specifically a couple of miles beneath the ground. Initially developed in 1987, the Coso Geothermal Field today pulls geothermal energy from about 85 wells at any given time. These wells can be up to 20,000 feet deep, tapping into a large hot fluid reservoir that has developed within the granitic basement. Total output capacity of the geothermal field is currently over 270 megawatts, energy which is delivered to the Southern California Edison power grid. According to this USGS circular, http://pubs.usgs.gov/circ/2004/c1249/c1249.pdf one megawatt can supply a community of 1,000 people. The plant enjoys over 98 percent on-line availability and since 1987 has delivered more than 26,000 gigawatt-hours of electricity. Our first stop was off Hwy 395, prior to getting to the Coso field. We climbed up the west side of the valley floor to see some spectacular pegmatite. Looking back east across the Indian Wells Valley provided a sweeping view of the Coso Volcanic Range. After a mid-morning fuel stop at Coso Junction, we reduced the carpools to just three vehicles and entered the China Lake NAWS. Our first stop in the Coso field was at a viewpoint looking east where we could see many young rhyolite domes. Andy provided more detail on the geologic setting. Mesozoic plutonic and metamorphic rocks similar to those of the southern Sierra Nevada underlie the area. It is within these fractured rocks that the hot fluids are trapped. The basement rock is unconformably overlain by Pliocene volcanic rocks, which account for almost 90 percent of the total volume of volcanic rocks in this area. Finally, we have the bimodal Pleistocene/Holocene volcanism: basalt flows or high-silica rhyolite domes. The next stop took us up-close to a dome where we scrambled about and examined the volcanic products. We then went on to a field overlooking one of four geothermal plants. 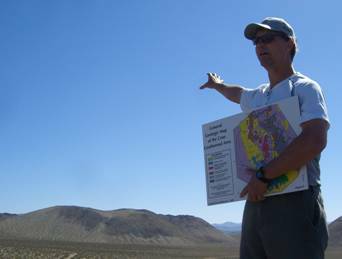 We were next to the youngest rhyolite dome in the area and could see a well-preserved tuff ring around it. The top of the ring made a convenient location for one of the dirt roads leading towards the plant. While at this viewpoint, we could see the basic parts of the plant including all the pipes leading from the wells to the plant, the turbine enclosures and the cooling towers. 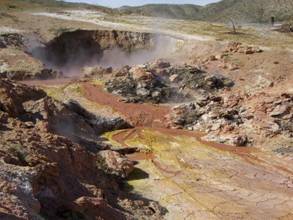 The process to create geothermal power initiates when fluids in liquid or steam phases are brought up from the fractured rock reservoir below. It is then flashed, or depressurized into steam. The steam drives a turbine that in turn drives an electrical generator. After using the hot fluids to generate electricity, the cooled fluids are then re-injected into the ground. This last step is very important, as most geothermal systems will run out of water long before they run out of heat from the magma below. Since the area is tectonically active, with heat fairly close to the surface, Andy was able to show us surface expression of the faults. We crossed a linear feature that consisted of a series of small red mud volcanoes (erupting! ), bubbly carbonate areas and streaks of burned vegetation. These marked the strike one of the many normal faults in the area. A potential visit to another hot springs area was thwarted by a new gate-lock across a narrow road. After executing 17-point turnarounds, we headed off to investigate a large travertine outcrop. Our last stop leaving the China Lake NAWS in the late afternoon was a viewpoint where we could see the backside of Red Hill cinder cone and the Sierra fault scarp across the valley floor. Most of the group went on to explore Fossil Falls, where the Owens River sculpted fantastic potholes and other curvy shapes in the basalt flows. Other side trips included a stop to investigate the colorful Ricardo Formation at Red Rock Canyon state park. We wish to thank Andy Sabin for a most informative and jam-packed trip as well as Mark Sorenson for suggesting the field trip. We sincerely appreciate that he could take time on his Saturday to give us a tour and an understanding of the “geo” behind the “geothermal” of this area. We also thank Rob Nelson for handling trip logistics for this field trip.